Today, Opera has showcased its first ever concept browser, codenamed Opera Neon. Since it’s inception twenty years ago, the internet has become an essential part of our lives. Every day, billions of people access it using their favorite web browsers. But the internet keeps changing, and so must the browsers. In the past year, Opera has stepped up the game for browsers, introducing novel features such as free VPN and native ad-blocking, but the company has realized it’s now time for someone to properly challenge the browser industry. Opera Neon is a concept browser built from the same browser engine as the Opera browser; it’s designed to allow users to focus on the most important part of the internet: the content. Opera Neon will provide users with fun ways to interact with web content, including the ability to drag and push things around, and even to even pop content out from the web. New start page using users’ current desktop background image. A left sidebar with video player, image gallery, and download manager. A new visual tab bar on the right side of the browser window that makes it easier to distinguish between tabs. An intelligent system that automatically manages tabs; like gravity, frequently-used tabs float to the top, while rarely-used tabs will sink to the bottom. A completely new omnibox, supporting top search engines and open search. Snap-to-gallery, which allows users to snapshot and crop any part of a web page and save to the gallery for later use. A split screen mode which allows for two pages to be used simultaneously. Opera Neon is a concept browser, meaning a vision for the future of browsers. It will not replace the current Opera browser. However, some of its new features are expected to be added to Opera this spring. 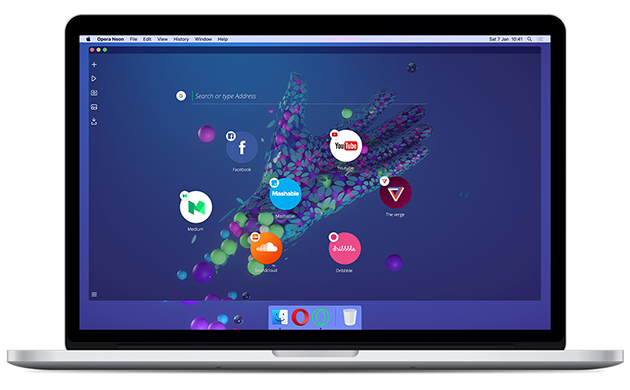 Opera Neon is available for testing as a free download for Windows and Mac. Watch the product video and the behind the scenes video.